and Patty Manos, 17, Carlsbad in garden show exhibit. 25/26: Annabelle Scott, 16, of Lemon Grove holds model with Thor Abel missile in background. 3/4: Nancy Fretz, 17, Escondido, and Monica Lindkvist, 18, La Jolla, bring sweet music to Church Nordquist, Fallbrook Future Farmers of America, and his Hereford steer. 1/2: Lougene Porter, 20 months, of Canoga Park, with goat kid. 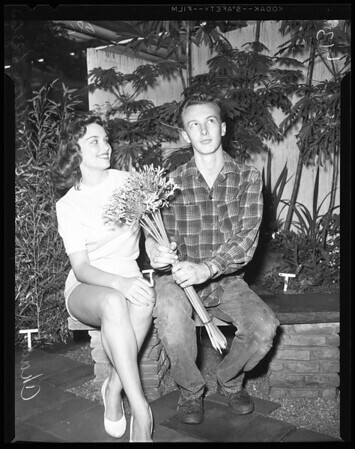 13/14: Charlene McCoy, 17, San Diego with Walter Anderson, 19, of San Diego in garden show exhibit".